Yesterday evening I felt like making something different from the usual stuff I cook. Not that I always cook the same things but I felt more experimental than usual. I love to improvise with what I have in the fridge and to try unusual combinations like this one: prawns and n’duja, the wonderfully tasty hot salami paste with red chili peppers from Calabria. In the fridge I had some Black Tiger prawns already de-shelled and de-veined plus a bunch of spring onions and two big organic courgettes. This is the end result of my little experiment: a nice and hot surf & turf dish that I’ve enjoyed with two glasses of cold Villa Antinori Bianco. Mixing together ingredients that are not exactly an obvious combination I managed to create a captivating dish that really surprised me. The recipe? Peel the onion and cut it in rings (not too thick). 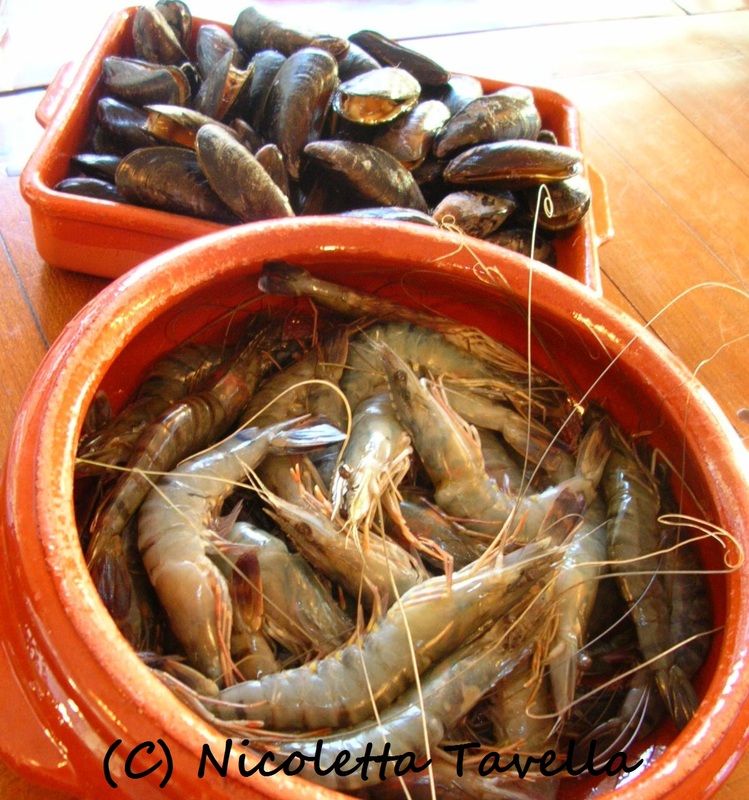 Fry them in olive oil together with the peeled ad sliced garlic. Once the onion is well cooked (soft and glazy), caramelize it lightly by adding the sugar and let it cook a bit further if it’s still too wet. Remove and discard the ends of the zucchini. Cut the zucchini lengthwise in halves and then slice them not too thinly. Add the courgette slices to the caramelized onion and let them cook with the lid on the pan until reasonably tender (they have to be still a bit al dente). Add the Spring onions cut in chunks of about 3-4 cm and the n’duja. Let everything simmer for another minute stirring regularly. Add the prawns, season with salt and cook further for a maximum of 3 more minutes, stirring from time to time. About one minute before ending the cooking process add the white wine, stir and let it evaporate. (Recipe in Italian here) I always wanted to try crab cakes "the American way" (I had already tasted a very spicy version in Thailand, simply fantastic) and I was finally able to eat them in the States in 2006 when my Tarot teacher, Christopher Beaver, made them one evening. I was staying at his place in Telluride, Colorado, for a Tarot course. He loves to cook for his guests so when he said he was going to make them I jumped up and said 'Yessssss!'. They were really good and since then I simply ADORE them. Too bad I never wrote down his recipe but I've recently come up with one that was inspired by the incredibly many versions that I've found online. It's tasty, slightly spicy and quite lemony. In short: great! I've used crab meat in tins since the fresh one - the very best - is not that easy to find here in Holland (what you can buy here is mostly frozen and often too wet and spongy). For the deep fried version I would definitely cover them with Panko, the flaky Japanese breadcrumbs, to make them crunchier. In this sautéed version I use Panko in the crab cakes mixture. Not too much because they're nicer when the mixture is quite moist but just enough to give it a bit more body and texture. The pictures have been taken with my mobile phone while I was cooking at a friend's garden dinner party and they're not exactly high quality but I think they give a nice idea of how these crab cakes look like. Remove the stem and seeds from the chilli peppers. Chop the cleaned chillies but not too finely, it's nice to see the little red chunks inside the crab cakes. If you use tinned or frozen crab meat, press it well to squeeze out all the excess juice. Mix the crab meat with the beaten eggs, the chillies, the finely chopped parsley, the Panko breadcrumbs, the thyme leaves, the grated lemon zest, some lime juice, the mayonnaise and some salt and pepper to taste. Add a bit more Panko if the mixture is too wet but don't make it too firm either by overadding breadcrumbs. Shape the mixture into eight patties the size of a small hamburger. Fry the crab cakes in hot olive oil and serve immediately garnished with sliced lime and fresh flat-leaf parsley. Crab cakes and salad, yum! My first culinary video as a "director" is one of the most typical dishes from Bari, in Puglia, and it's called tiella di riso, patate e cozze. This is my Mum's version - the hands you see are hers :) - and she changes the original recipe a bit using shelled raw mussels instead of half shells (filled with mussels, of course) because the end result is then easier to cut (no hard stuff in between rice and potatoes to make cutting difficult). The positive aspect of using shells is that they fill with cooked rice grains that soak up the wonderful juices of the mussels and make it more fun to eat. Use potatoes that stay nice and firm. Cut them with a mandoline to ensure very thin slices. You'll have to check from time to time if they are cooked inserting a knife to feel their texture. When they're ready it will be very easy to pierce them. Gabriella uses about a kilo of shelled mussels but if you use the de-shelled ones one and a half kilo will do perfectly fine (they take more space inside the oven dish). The type of rice is Vialone Nano but Carnaroli is great too. Use two handsful of grated pecorino romano cheese that will be mixed with a couple of finely chopped garlic cloves and a bunch of flat leaf parsley, also chopped. Some freshly ground black pepper is also nice. Use the mixture of cheese, garlic and parsley twice (two layers, also on top of the mussels) in between layers of other ingredients. The water you add before putting the dish in the oven has to be salted and very hot (almost boiling). Cover the tiella up to the rim and put in the pre-heated oven at 240°C - 464° F for about 20-25 minutes until well cooked and golden brown. 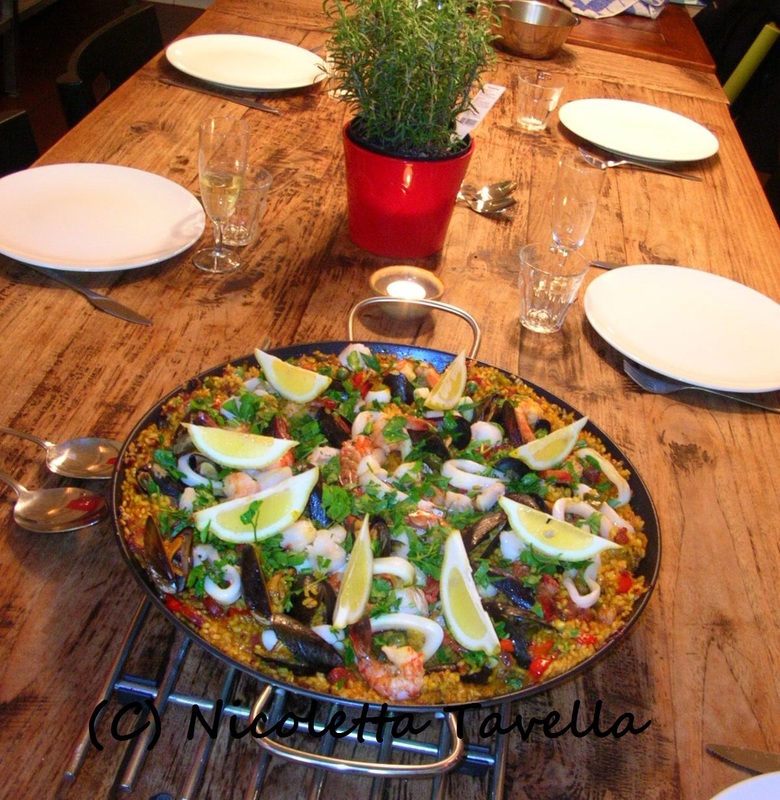 Tiella with rice, potatoes and mussels from Nicoletta Tavella on Vimeo. What do you do when you just made pasta with shrimp and zucchini and you cooked far too many shrimps? Well... you can use the extra shrimp for pasta salad the day after, for example. This is a summer salad because of the green beans and the ripe tomatoes (even though nowadays you can find both 364 days a year...). I used the little pomodori that here in Holland are sold with the dubious commercial name of San Mazzo - dubious because the Dutch clearly do NOT know what mazzo in Italian can mean (bum, bottom, a**), guess they wanted something that sounded like San Marzano, the original name of plum tomatoes, but had no intention of spending a few euros to ask a native speaker if there were any "hidden tricks" in the name they had chosen. Back to the salad: the fresh note is given by the lime juice. Lots of it. I'm a big lime lover and I tend to overdo it so start with the juice of 1 lime, see if it's not too acid for you and then proceed with the second one if you think you can handle the extra tartness. The other very Italian taste in this salad besides that of the plum tomatoes is given by the Taggiasche olives from Liguria. They're little, dark purple olives with a very peculiar and unique flavour. Extremely yummy, I find, and if used with moderation - their taste is quite strong - they add a very original note to your dishes. I usually steam the green beans to keep them nice and al dente. This salad is much nicer if made a lot in advance so all the flavours can combine properly. Cook the pasta very al dente in salted boiling water. Drain and rinse immediately under the tap with cold water. Set aside in a big bowl and mix with a little olive oil to avoid sticking. Slice the spring onions, chop the tomatoes and cut the green beans in two. Finely chop a lot of flat-leaf parsley and add it to the pasta. Add the rest of the ingredients to the pasta, season with salt and pepper and mix well. A bit démodé, if you like (soooo old fashioned), but still one of the classiest Italian comfort foods ever: pasta with courgette, shrimp and cream. With a hint of basil, to celebrate the summer (and because basil goes so friggin' well with courgettes). And do not, I repeat, do NOT, use Parmesan cheese. Any Italian would punch you right in the face for doing something like that when pasta with fish or seafood is involved. If you still decide to do it, at least make sure there's no Italians around. Fry the finely chopped onion gently in olive oil until soft and golden brown. Add the sliced courgette and let is cook until soft and slightly browned stirring regularly. Add the cream and the defrosted shrimps and let everything cook for 2 minutes. Add some fresh shredded basil leaves, season with some salt and mix everything well. Cook the pasta very al dente in boiling salted water while making the sauce and drain. Add the pasta to the sauce, toss gently and serve with a generous sprinkle of freshly ground black pepper.